You can renew your books online through the EKU Libraries website or by calling the Libraries help desk at 859-622-1790. Below are the steps to renew your books online. Step One: Start at the EKU Libraries' webpage and click on RENEW MY BOOKS. Step Two: Login using your EKU username and password. This will be the same username and password you use for your EKU e-mail and Blackboard accounts. 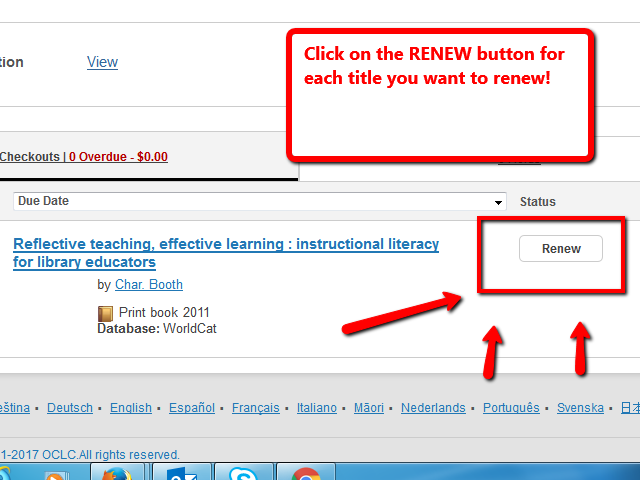 Step Three: Simply click on the RENEW button for EACH title you wish to renew. Tip! Interlibrary loan items that belong to another library must be renewed by contacting the Library Express office. Items that do not belong to EKU and have been borrowed from another institution can not be renewed online. Contact the Library Express office directly.